Margrit Coates has paved the way for healing for horses to become well known worldwide and her books, lectures and clinics have brought animal healing into respectability. Her particular empathy with horses is now legendary. Margrit has been featured in numerous magazines including Horse and Rider, Horse, Horse and Hound, Your Horse, and the New York Daily News. She has written columns for several magazines including a pet column for the UK’s Daily Mail newspaper. 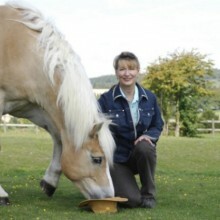 Margrit has also been featured in several TV programmes with both horses and companion animals and gives frequent radio interviews about her work. Margrit is the author of six groundbreaking books – “Healing for Horses”, “Hands on healing for Pets”, “Horses Talking”, “Connecting with Horses”, “Angel Pets”, and “Communicating with Animals”.